The Simon Says Stamp Flickr challenge #52 theme is “CUT IT OUT!” This means creating a card using some die-cutting. That being said, I tried to use NO stamping and only die-cutting on this project. However, I wimped out a bit on this when I realized I need a little texture for the background. So I used a background stamp. 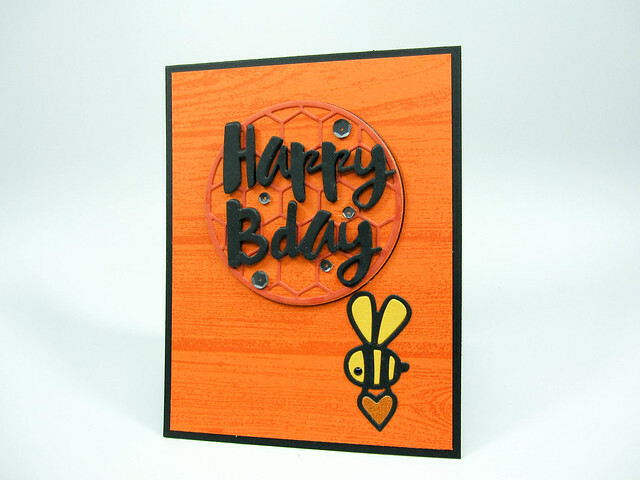 The SSS Hexagon Pattern Circle die reminds me of a honeycomb and bees, so I decided the card was going to be a B-day card. I used the SSS Painted Happy Birthday wafer die and cut it out of black cardstock. To emphasize the “bee” or “B” theme, I cut apart the word birthday so I only used the “B” and the “day” for the birthday part of the sentiment. I realized as I planned the layout of the card, it kind of looked plain. So I used one of my new background stamps from Concord & 9th (absolutely love their stamps) to simulate the wood you would find in those wooden beehives in apiaries. The structure of the card was simple after die-cutting all the pieces. I used a piece of A2 sized orange colored cardstock and stamped the wood background onto it with some orange ink for a more subtle tone-on-tone pattern. I later cut this down by a quarter of an inch on each of the dimensions so that it was 4-inches by 5.25-inches. Using the solid circle die that comes with the Hexagon circle die set, I cut a circle in the exact spot I wanted the open hexagon circle to be. I mounted the solid circle piece to the back of the hexagon circle and this was mounted onto black fun foam for dimension. The orange wood background piece was mounted onto a top-folding A2 portrait-oriented card base and then the entire circle piece was placed over the die-cut hole in the card front. I made sure that the woodgrain behind the circle lined up with the wood background piece before adhering it to the front of the card. I die cut a cute bee from black cardstock with Paper Smooches’ Bee Dies. There are two bees in that die set and I used the one that was carrying a little heart. The black outline of the bee was used and I also die cut the same bee from some bright yellow cardstock scrap and used that for the bee’s stripes and wings. The black-outlined bee was adhered to the bottom left of the circle and I then glued the little stripe and wing pieces in using a glue pen. The heart at the bottom of the bee’s feet was die cut from a scrap of yellow/gold glitter paper from my stash. I added a tiny black enamel dot for the bee’s eye (also from my stash). The “Happy”, “B,” and “day” word pieces were mounted onto black fun foam and then glued to the front of the hexagon circle. There is a lot of assembly involved when making a card using mostly dies, but it is rewarding once the final project is complete. I like the dimension on the card created by the raised sentiment and different die cut pieces. Hope you have a bee-you-tiful day! Dies: Simon Says Stamp: Hexagon Circle wafer die set, Painted Happy Birthday wafer die; Paper Smooches: Bees die. Stamps: Concord & 9th: Barnwood Background stamp. Ink: Simon Says Stamp: Orange Peel. Cardstock: Simon Says Stamp Cardstock: Burnt Orange (for the hexagon circle); Orange Peel (for the card front); Black (for the sentiment, bee outline piece, and card base); yellow scrap cardstock from my stash (stripes on the bee’s body and wings). Other: Small black enamel dot (for bee’s eye) from my stash; yellow/gold glitter paper (for bee’s body stripes) from my stash. The inspirational photo shown below was provided as a starting point for the Ellen Hutson August, 2016 Pin-Sights Challenge. The beautiful floral images in this photo are my point of reference for this challenge as well as the soft, graceful pleats on the back of the bride’s gown. To imitate the pleats, I used the W R Memory Keeps Next Level 3D embossing folder named Wave. There are two folders in this set, and I chose to use the one with the soft wavy linear lines. I can’t say enough about how I love WRMK’s 3D embossing folders. I have a few of the sets and can’t say which one is my favorite. If you like interesting and unique dimension in your cards like I do, try out one of these folder sets. They really give a card that special something. I don’t know if my photo of the card does the wave pattern justice. The lines are so pretty and subtle. 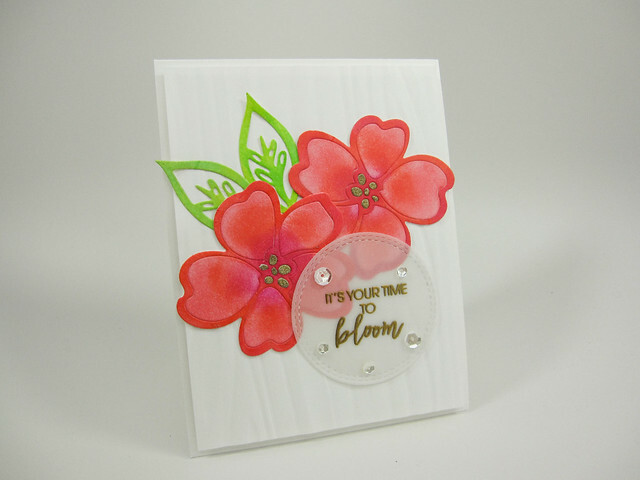 Since I had decided on using an embossing folder for the background, I chose to use die-cut flowers on top of the embossing. I didn’t think stamping on the embossed surface would produce a clean stamped image. The Essentials by Ellen line has a lot of beautiful floral dies. I chose a flower die and leaves from the Wild Garden die set. I die cut the flowers and leaves from the set using Neenah Solar White 80# cardstock. Using sponge daubers, I used distress inks to color the flowers and leaves. I used separate daubers for each color. The flowers were blended using the colors Worn Lipstick, Abandoned Coral, and Picked Raspberry. The leaves were colored by blending Twisted Citron and Cracked Pistachio. The die-cut flower pieces and leaves were assembled and glued onto the embossed card front as you see. The sentiment was heat embossed with gold embossing powder onto a double-stitched circle. Sparkling Clear sequins were added to the front of the circle with micro glue dots. The circle was then glued to the card using the same micro glue dots hidden behind the clear sparkling sequins on the circle. Since the card front was slightly warped due to the embossing, I cut down its original size from 4.25” by 5.5” to 4.0” by 5.25”. The piece was then adhered to a piece of white fun foam cut slightly smaller in dimension. I used Be Creative Tape for this. The front of the card was then mounted onto a top-folding, portrait-oriented card base cut from Neenah Solar White 110# cardstock. Hope you like my inspiration for the Pin-Sights Challenge. Dies: Essentials by Ellen: Wild Garden; My Favorite Things: Doubled-Stitched Circle Stax die set. Stamps: Essentials by Ellen: Lovely stamp set (sentiment). Embossing Folder: We R Memory Keepers Next Level 3D Embossing Folders: Wave. Ink: Tim Holtz Distress Inks: Worn Lipstick, Abandoned Coral, Picked Raspberry, Twisted Citron, Cracked Pistachio ; Versamark Ink. Cardstock: Neenah Solar White 80#; Neenah Solar White 110#; Bazzill Vellum 40#. I’ve never applied to any cardmaking blog to be a guest artist before. So I’m taking the leap and applying as a Pin-Sight guest artist for Ellen Hutson’s Classroom! 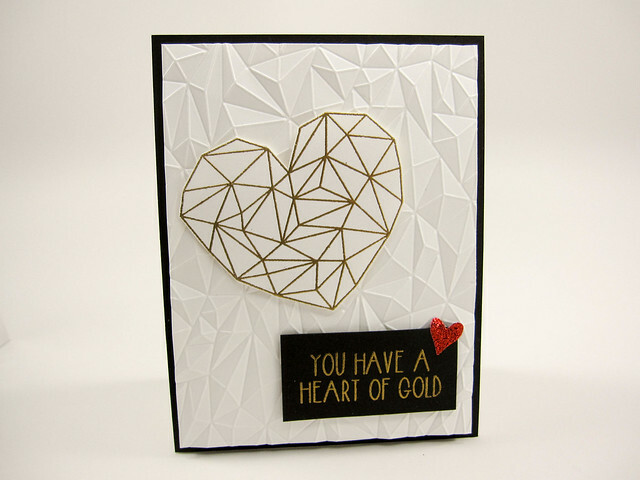 I decided to create a card with a very graphic look using two of my favorite Essentials by Ellen products: Bokeh Dots stamp set and the Be-You-Tiful word die. I like bold colors and shapes when creating graphic cards and I think the neon pink against the black elements in the card create that effect. The supplies in this card are pretty minimal compared to some other cards I have made. I used two different inks, three different cardstocks and two Essentials by Ellen products. Less is more when I create a graphic card. I used the sketchy circles from the Bokeh Dots set and stamped a random pattern using black ink on A2-sized piece of white cardstock. I then used one of the solid dots from the set to stamp bright pink dots in the center of most of the sketchy circles. The die-cut sentiment was created by cutting the die piece 3 times and adhering the 3 dies together using a glue pen. This gave the sentiment more dimension. I also cut a 2-inch by 2.5-inch piece of vellum to which I matted the sentiment and then glued this to the front of the card. The vellum made the sentiment stand out against the busy circle pattern. I decided that the pattern looked better with a frame. So, I cut down the A2 card front down to 4 inches by 5.25 inches and matted the card front to an A2-sized piece of black cardstock. The entire piece was then mounted onto an top-folding, portrait-oriented card base. I like the way this card turned out. The colors remind me of Good and Plenty candy! Unfortunately, I’m not a real fan of the candy, but I am a fan of the colors! Inks: Ranger Archival Ink: Jet Black; Hero Arts Neon Ink: Neon Pink. Cardstocks: Neenah Solar White 80lb. for card front; Bazzill Card Shoppe Cardstock: Licorice Twist; Bazzill Vellum 40lb.